← Religious Detox: Can I do it? What every man needs – a camel that doesn’t spit. 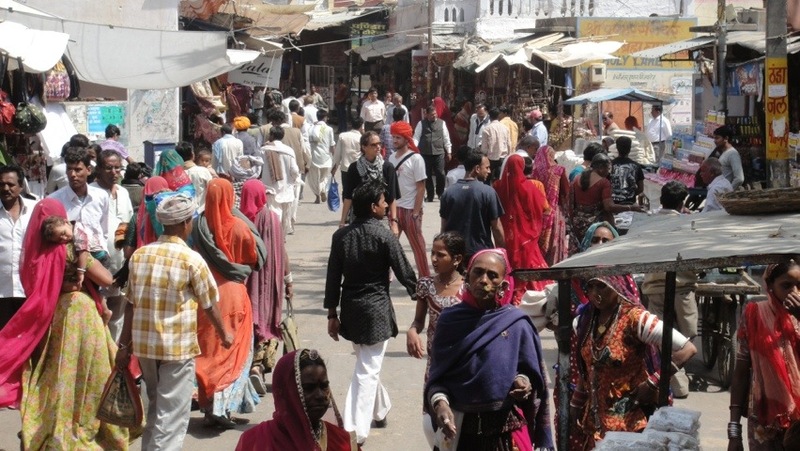 Yep, we’re still in Pushkar, on the edge of the Rajasthan desert. Four days on the edge of the holy lake has lost its magic. We’ve wandered the bazaar, marvelled at temples and lay around the palace pool. The place is dirty. Of course, we are used to the usual open sewers, litter everywhere and desert sand that blows in clouds along with plastic bags around this sacred city. The place is full of dread-locked hippies from every corner of the affluent western world wandering the streets in totally disrespectful clothes (the local people here are always covered up due to the religious nature of the town) and every one of them needs a good wash. This is one of the major stops on the tie-dyed India Hippy Trail. And yes, I have forgotten I was one of them twenty years ago (minus the dreadlocks of course; I mean, can you really imagine me with dreadlocks?). The religious fervour of the town’s pilgrims. Last night their religious zeal lasted until 6am with loud Hindi music, chanting and fireworks (which seem to be a nightly occurrence). The white and orange robed priests who always gently offer to make prayers for you, or put a garland of flowers around your wrists, only to then aggressively insist that you make a large donation to ‘their’ cause. See what four days without meat and alcohol has done to me: I’m a grumpy, cynical old man. I feel so much better after that rant. Now I’m reflecting on the wonderful vegetarian meals I’ve had on roof top restaurants looking down over Lake Pushkar. The wonderful views we experienced from mountain top temples. Climbing the steep and uneven stone steps in the early morning. Sharing water and encouragement with groups of chanting pilgrims as we climbed to the top together (nothing as tall as Adams Peak, Mum & Dad). The amazing local people we’ve met in the bazaars, selling hand loomed and dyed fabrics, or hand thrown and fired pottery made in the surrounding areas. Village people who are demonstrating the “fair trade” principal as they proudly display handicrafts that haven’t changed in design or construction for centuries. Or the camel ride we took through the surrounding desert, starting in the early morning to beat the heat. I was surprised to find our camels didn’t spit (well, not nearly as much as the camel owner who was seated on the other side of the hump behind me). 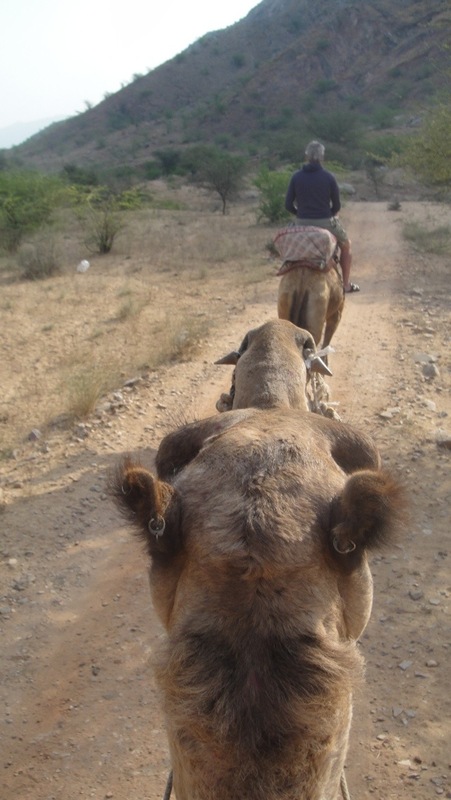 Unfortunately Mike is still suffering “camel arse” from that bumpy morning sojourn into the Rajasthan desert. So on reflection, my glass of “Masala Tea” is definitely half full, not half empty. Tomorrow we start the day at 3am to drive out of the desert and down to Ajmer, where we catch a train to Agra, and the Taj Mahal. And a Gin & Tonic with our Tandoori chicken. Time to go and watch our last sunset over one of India’s most religious lakes, tuck into a vegetarian marvel, and sip from a glass of yogurt and rose water lassi! This entry was posted in India and tagged India. Bookmark the permalink. 1 Response to What every man needs – a camel that doesn’t spit.